When children need kidney dialysis because of disease or congenital defects, doctors are forced to adapt adult-size dialysis equipment. No FDA-approved kidney replacement devices exist that are specifically designed for children. To address this problem, physicians and researchers from Emory University, Children’s Healthcare of Atlanta and the Georgia Institute of Technology have teamed up to develop a kidney replacement device capable of treating children. Over the past five years, the three institutions have further solidified a cohesive relationship aimed at medical discovery, quality-care improvement and health care innovation. The team has been awarded a Challenge grant of $1 million from the National Institutes of Health (NIH) to refine a prototype device. The grant is part of the American Recovery and Reinvestment Act (ARRA) funding. Challenge grants are part of a new NIH program to stimulate rapid advances in focused disease areas. Matthew Paden, MD, assistant professor of pediatrics (critical care) at Emory University School of Medicine and a physician at Children’s Healthcare of Atlanta, is the grant’s principal investigator. Ajit P. Yoganathan, PhD, Regents’ Professor of biomedical engineering in the Wallace H. Coulter Department of Biomedical Engineering at Georgia Tech and Emory University, is the grant’s co-investigator. In the United States, it is estimated that at least 5,000 children per year, or 1 percent of the 500,000 children admitted to intensive care units, require some form of renal replacement therapy. Children may need kidney replacement therapy because of severe infections that lead to the kidney-damaging inflammatory condition called sepsis, or because of congenital defects, which can only be permanently remedied by a kidney transplant. Paden says adult dialysis equipment can have a tendency to withdraw too much fluid from a pediatric patient, leading to dehydration and loss of blood pressure. Other possible problems resulting from inaccurate dialysis equipment include clotting or internal bleeding. Part of the problem is that the volume of blood required to fill up the tubes leading to and from the apparatus is too large, Paden says. As the child gets smaller, the proportion of blood outside the body gets larger. Existing dialysis equipment for adults takes up space comparable to a refrigerator, while Paden says the team’s goal is to have a pediatric device the size of a shoebox. Lakshmi Prasad Dasi, PhD, former research engineer at Georgia Tech, now assistant professor of mechanical engineering at Colorado State University. The team’s plan is to test their prototype in the laboratory and prepare for live experiments over the next two years, with the goal of being ready for clinical trials in five years. The team’s prototype device is also designed to work in tandem with equipment that replaces the function of the heart and lungs for severely ill patients. 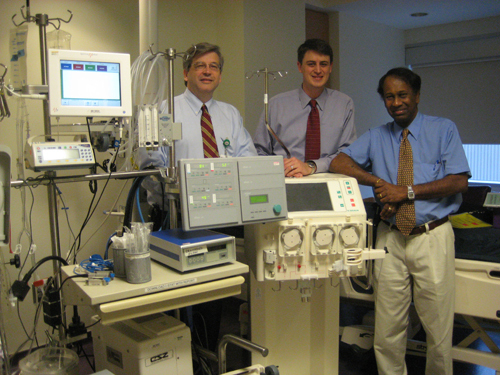 Extracorporeal membrane oxygenation (ECMO) equipment is commonly used in neonatal intensive care units for newborns whose lungs can’t work properly. Children requiring ECMO often have fluid overload and swelling. The demand for ECMO has been rising because of H1N1 influenza, which in severe cases leads to respiratory failure. Emory, Georgia Tech and Children’s Healthcare of Atlanta are in the process of patenting the kidney replacement device. As the technology is developed further, it could be licensed to an existing company or a new start-up company.